The highlight of the exhibit space is a new state-of-the art 7D capsule theater that takes visitors on an exhilarating flight through the sky. This new exhibit experience uses a 3D aviation film, moving seats, and multi-sensory effects to create an unforgettable, educational, and exciting experience. The new Simulation Theater is made possible by a generous gift from the Emil Buehler Perpetual Trust. Aviation enthusiasts of all ages will have a blast exploring the many interactive displays in the Museum of Discovery and Science’s refreshed aviation station, To Fly. 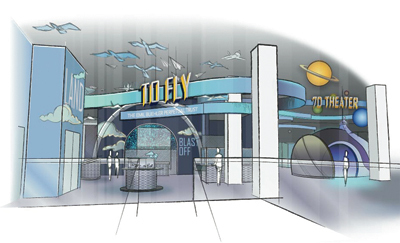 This interactive exhibit will immerse visitors in aviation technology. By exploring different areas within the exhibit, visitors can learn about controlled flight, fundamentals of flight, navigation, and the materials used to build planes. The exhibit enhancements were made possible by a generous gift from the Emil Buehler Perpetual Trust. 7D-multi-sensory theater capsule – this simulator uses moving seats, high definition 3D film and other special effects to allow visitors to “fly” in a variety of aircraft. Feel the Lift – be transformed into a bird by putting on wings and standing in front of our wind machine so you can see what it feels like to fly. Pitch Yaw Roll – learn the three basic controls of planes. Air traffic control tower – learn how air traffic controllers navigate planes. Plane Stuff – visitors can compare the weight of various metals used to construct an aircraft. Study wall-sized murals that depict a detailed cutaway diagram of the Air Bus A380 and a birds-eye view of the Fort Lauderdale Airport. Mars Rover Simulator Ride – Go on an exciting expedition to explore the red planet – Mars. This space ship takes visitors to explore four of the most significant geological features on Mars (Olympus Mons, Ares Vallis, Valles Marineris and North Pole). MaxFlight full motion simulator ride – with 360 – degree pitch, roll and spin technology, visitors will be able to experience adrenaline-filled aerial races and stunt flying! *Note: You must be at least 48” tall to ride the MaxFlight motion simulator. *Note: You must be at least 48” tall to ride the MaxFlight motion simulator.